Ask us about special rates for non-profit and churches. Here's a few of our latest web projects. Bringing new life and a people-oriented focus to a well established church was an exciting undertaking for Next-Step-Up Communications. We created the new logo design, new signs and banners, and the creative concepts for welcoming visitors and guests to the church as well as the website. We used the existing content management system by IFB Technologies to adapt our custom web design with easy-to-update content. Rhonda is a nationally known speaker, author, humorist and radio personality. In preparation for her 4th book release, Rhonda wanted a new, fresh website displaying her playful personality and her warmth for God's people. Next-Step-Up created the new site, the new masthead, and several icons for user-interactivity. Her audience and peers were enthusiastic with the new look and recently launched e-newsletter: Shades of Rhea. For more about our E-newsletter services, click here. As a nationally-known author, speaker and teacher, Susanne needed to communicate her services to her audience through the internet. Next-Step-Up Communications came on board and created an icon for ministry, a creative use of her photographs, developed her promotional materials and created a powerful and informative website and e-newsletter. It was time for a redesign for this busy speaker and growing ministry. As the original designer for the ministry logo and starter of a self-maintained template for Yello-Umbrella Ministries in 2004, Next-Step-Up was brought in to make big changes: to custom design and write the content focusing on the Dr. Brand's soon-to-be published book and new features of her speaking ministry. 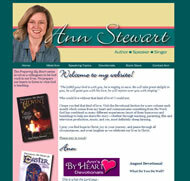 As a popular author of the "Preparing My Heart" bible studies, Ann needed a web presence and a creative online venue to stay in touch with her audiences. Next-Step-Up gave helpful direction to her local photographer, created custom page headlnes and visually appealing graphics for her writing column archive and devotionals. It's a sleek, easy-to-read, and colorful custom web design. 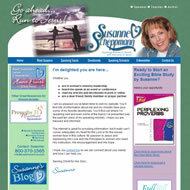 Incorporating designs from existing promotional material, Next-Step-Up developed a consistent website, wrote the entire website content, drafted a script for a promotional DVD, created a complimentary print brochure, and designed and write a bi-monthly newsletter for this ministry and missionary. This women's ministry website is for writers and readers to share their spiritual insights and life stories. We maintain the design, the content and promote the website. We also produce a monthly e-newsletter and distribute it to their readership. Make sure that you are in touch with the "felt needs" of your target audience and that you are focused on your purpose. Felt needs are a way to describe being aware of what's going on inside of your someone's mind. The list of felt needs can range from needing to part of something important to needing to be included. People respond when they feel that their needs are being met in someway. Your ministry or organization has a purpose to serve God but also to serve others. Do all you can to make it clear what your purpose truly is.